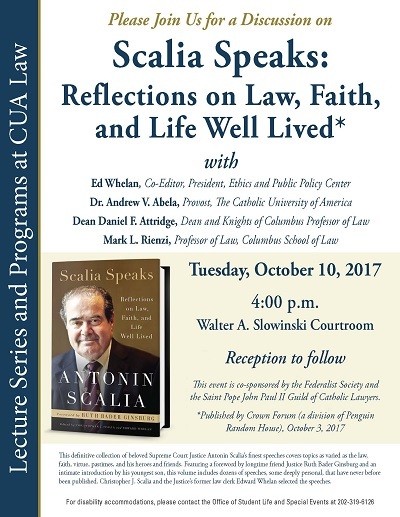 CUA Law Dean Daniel F. Attridge led a conversation between Ed Whelan and CUA Law Professor Mark Rienzi regarding the collection of Justice Scalia’s speeches covering topics such as the law, faith, virtue, and pastimes. Dr. Andrew V. Abela, Provost of the University, provided an introduction. Whelan, Ed and Rienzi, Mark L., "Scalia Speaks: Reflections on Law, Faith, and Life Well Lived" (2017). Other Lectures & Events. 9.